Jawbone's original Jambox made Bluetooth portable speakers a mass-market hit. Since then, though, Jawbone has started to lag behind as other companies have come out with better units that cost either the same price or less. 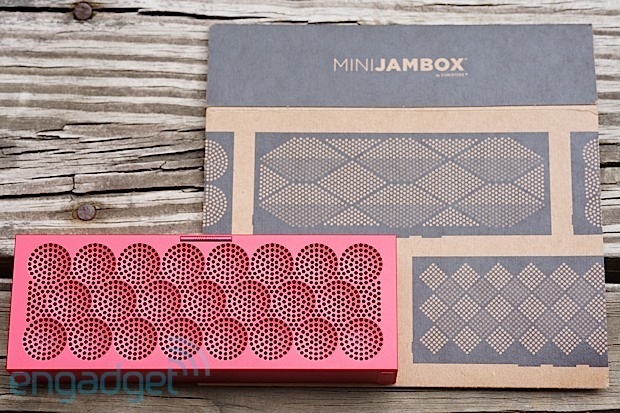 Now, the $180 Mini Jambox is here with an even more portable design to help Jawbone keep its edge. Now that we've gotten the chance to live with it for a few weeks, it's time to answer the big questions you might have before placing a pre-order. Does the Mini Jambox offer marked improvements over the original? Is it enough to compete with all the other options in this space? And, most importantly, is the price right? Read on for the Engadget take. The Mini might not be for everyone, but at the very least it's a clear improvement over the original Jambox for the same price. How would you rate the Mini Jambox? 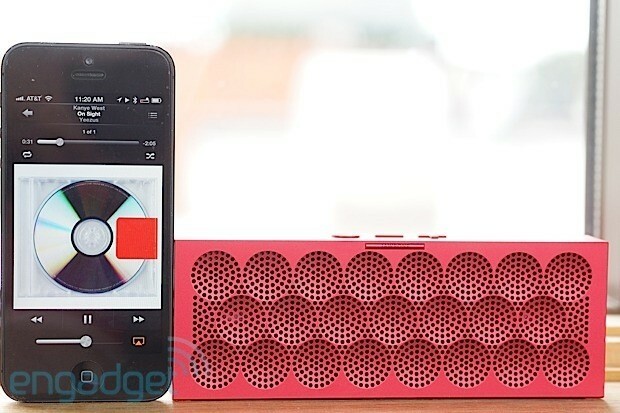 The Mini Jambox is what it sounds like: a Jambox, made smaller. Yves Béhar was yet again put in charge of the design, which maintains the same boxy shape and wavy speaker grille we've already grown accustomed to. The Mini comes clad in a rigid anodized-aluminum case, with strips of rubber at the sides that roll under the bottom edges to act as feet. Sadly, there's no way to angle the speaker or let the drivers face vertically for situations when you can't have it positioned in front of you. All told, it's available in nine colors, with five different grille textures. Our unit is the new take on the original "Red Dot" variation, which Jawbone has been shipping since the very beginning. The Mini Jambox is what it sounds like. On top, you'll notice volume keys and a multi-purpose button (play, pause, Siri / Google Now). The right side, meanwhile, houses a microphone, a pairing button, a micro-USB port (for charging and updates), a 3.5mm auxiliary input and a glowing power button. Speaking of the sort, every button offers a pleasing amount of tactile feedback, without being too "clicky." In the box, you'll find both 3.5mm audio and micro-USB cables, but the smaller size means a wall wart is now an extra $30. While we're on the subject of things you lose on this smaller model, the Mini is rated for 10 hours of battery life, just like on the original. down from 15 on the original. Don't worry, though: it was still enough keep us away from the power outlet for a few days. So, just how tiny is it compared to the original? The key difference is the thickness. The Mini comes in at 6.06 inches in length, 0.96 inch in width, 2.28 inches in height and weighs nine ounces, while the Jambox is 5.95 inches in length, 2.24 inches in width and 1.57 inches in height and weighs 12 ounces. Basically, the Mini will fit in your pants pocket -- even if you're wearing skinny jeans. Still, the 90-degree edges make it quite annoying in that particular scenario, despite Jawbone's suggestions to the contrary. Yes, it's a much smaller speaker, but unless you're wearing cargo pants, you'll want to toss it in your bag. Chop off another quarter of the thickness or taper the edges in a future model, and the pocket thing could be more realistic. Getting the unit to work with our devices was incredibly easy. When you power it up, you'll be greeted by a new take on the familiar boom and beep (there's a double beep when turning it off), which changes to a voice prompt that lets you know it's time to pair on your first go. The speaker handles two simultaneous connections at a time over a Bluetooth 4.0 Low Energy connection. From there, it's just like syncing up any other Bluetooth device. And on iOS, you'll see the nifty battery meter appear in your info bar too. 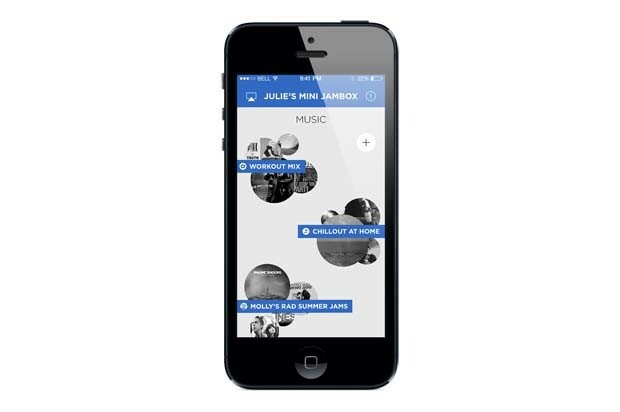 In addition to announcing the Mini Jambox, Jawbone introduced new apps for both iOS and Android. As before, you can use the MyTalk settings to make adjustments to the device itself, but it also adds a music player, which you can use to play locally stored iTunes music or stream from Spotify or Rdio. (More apps will be added at a later date, Jawbone says.) Unfortunately, though you can play locally stored music on either app, the streaming functionality only works on Android iOS for now. Sorry, folks! That disclaimer aside, the app works fluidly, but it isn't any more appealing than using other music apps. With that out of the way, let's talk about the rest of what the app has to offer. For starters, you'll have to log in on first use to register the device. Once you're in, you'll see options to change or turn off audio prompts (unfortunately, there's no way to select specific ones), along with a guided Bluetooth setup with a cheat sheet for all the button shortcuts. Throughout, the layout of the app is extremely easy to navigate and will match up with the color of your speaker. Updating the Mini with new firmware and features, however, is an annoying process. You'll find options to "install" different voices, languages and LiveAudio, but clicking these simply directs you to plug in your device and visit Jawbone's website. That said, LiveAudio doesn't come pre-installed on the Mini, like it did on the Big Jambox, so you'll need to download it. After logging in with your credentials, you'll need to install an updater onto your Windows or Mac machine, which merely stays active in the background. With the updater running and your Mini plugged into a USB port, you'll be able to finally update it through the website. We seriously hope that we'll one day be able to do all that from within the application. For what's it worth, we were able to carry out this process without any hiccups. You know, save for the fact that it can take up to five -- 56k modem-like -- minutes for any changes to apply while using the web interface. For its time, the Jambox was an impressive piece of kit. But now we've got lots of similar options, such as the UE Mobile Boombox, which easily bests the original Jambox in terms of audio quality. The biggest problem we've found with that older model is its tendency to become distorted at any reasonable volume level. We're happy to report, though, that performance is much improved in the Mini. All throughout the range of volume, its two drivers and passive bass radiator pushed out much smoother sonic waves. There was no major distortion from the aggressive samples on Yeezus to the heaviest of Jimmy Eat World tracks. It does feel slightly compressed and veiled with noticeable limiting, though. This is likely thanks to a loudness-compensation algorithm, compression and Jawbone's own EQ, which seem to work more aggressively here than on the Big Jambox; you can't get this unit to distort because it won't even get loud enough to. The Mini impresses initially with a healthy amount of thump, but this means the drivers can't pierce through noise pollution like SOL Republic's $200 Deck, which has an outdoor mode. There is a LiveAudio setting on the Jawbone Mini (enabled within the app or by holding both volume buttons), but it merely serves to provide a "3D" sound. It's a decent little option for widening the soundstage, but usually it makes a negligible difference -- just like on the Big Jambox. 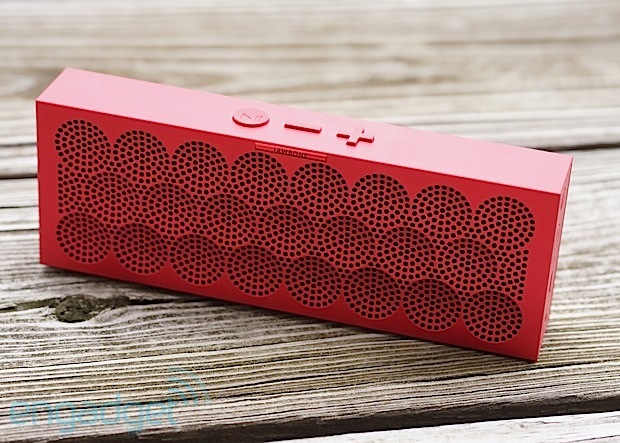 We'd also be remiss not to point out that the $200 Beats Pill goes a few notches louder and sounds noticeably clearer, but the Mini Jambox balances this out by maintaining a much more consistent wireless connection. Granted, the speakers we've mentioned have bigger dimensions, but they'll all fit in a jacket pocket when it comes down to it. On the opposite end, this puppy easily outclasses the UE Mobile Boombox, which has been besting the OG for a while. For all the improvements Jawbone's made in the audio department, the Mini still suffers from the same fatal flaw as its predecessor: it's just not loud enough for use in areas with moderate ambient noise. We can't shake the feeling that a louder volume output from the size of the original Jambox would have been more useful than sizing everything down. Make no mistake, though, the level of volume and clarity the Mini outputs is still very impressive for a speaker this size. Finally, a note about that speakerphone functionality: I found myself frustrated with calls. No one ever complained about clarity, but there were usually complaints about my voice not coming through loud enough unless I was seated in front of the speaker. We're smitten with the Mini Jambox's colorful styling and well-constructed casing, not to mention the improved app, but it mainly seems to raise the bar within Jawbone's own product lineup. It's hard to justify the $180 price if loudness is a concern, especially with competing products from SOL Republic, Logitech and Beats priced about the same, or even cheaper. That said, the price is right if you're interested in what the Mini Jambox has to offer -- namely, a stylish, well-built Bluetooth speaker with extended app functionality. Whether or not you're sold, don't even think about getting the regular Jambox instead of this: the Mini is a clear improvement over the original for the same price.